When the hustle of PCS season is over and spouses begin accepting job offers, my inbox gets flooded with questions about completing forms W-4. 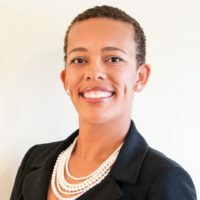 While the federal information provided here is applicable to all, the state forms only address the most common scenario I come across – dual income with shared state of residence. If you and your spouse do not share the same state of residence, contact me for assistance. Claim all allowances on the spouses W-4 with the highest paying job and claim zero allowances on the W-4 filed for all other jobs. 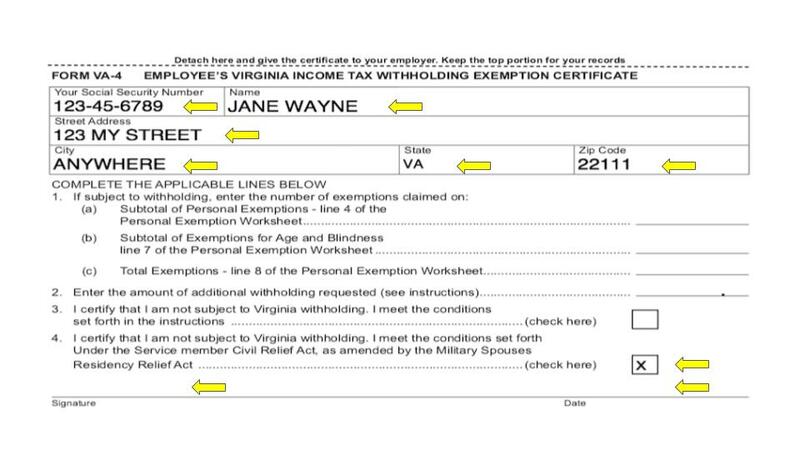 For example, if you earn $50,000 per year and your spouse earns $80,000, your W-4 should look like the one below. 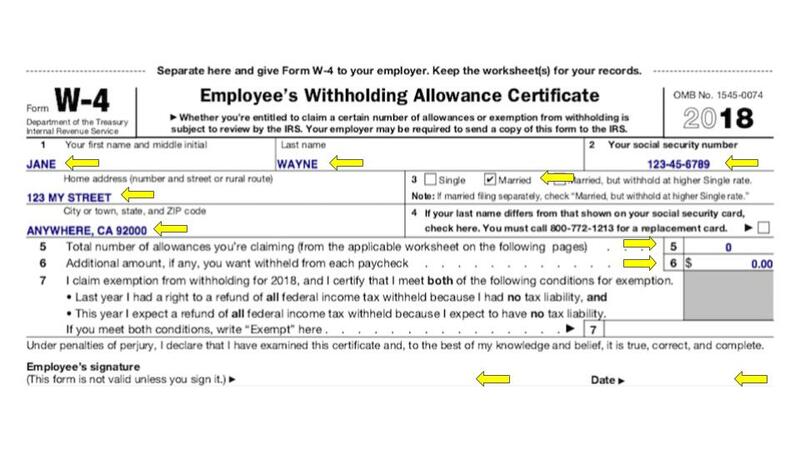 Using last years tax return, your spouse will need to complete the personal allowance worksheet (or use the IRS Withholdings Calculator) to determine what to enter on lines 5 and 6 of their W-4. Remember, the higher your allowance number, the less income tax will be withheld from your pay. Service members can change their withholding allowance via MyPay and civilian employees should contact HR. If you are a military spouse who meets the Military Spouse Residency Relief Act qualifications, you are exempt from paying state income taxes in your new duty station location. For example, if you and your active duty spouse are both residents of FL but currently live in CA or VA, your W-4 should look like one of the two below. 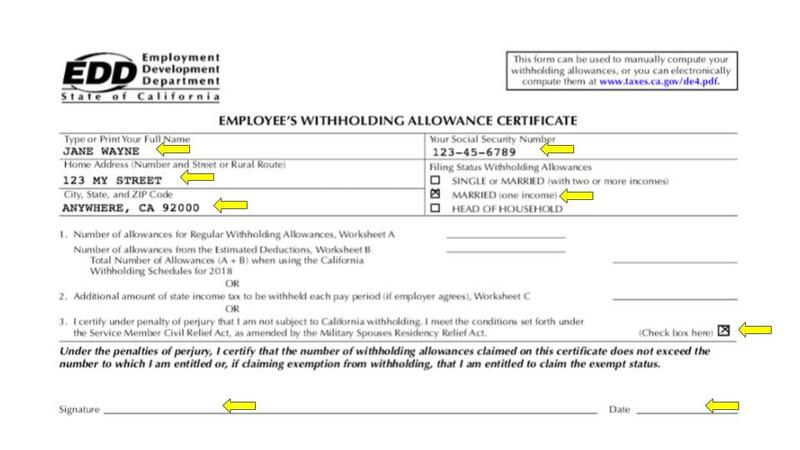 Use your physical address on this form and submit it annually to your HR department to prevent state tax withholdings. Depending on the rules of your home state, you may be required to submit estimated taxes to them to avoid underpayment penalties when you file your resident state tax return.